Situated in the heart of England, the Peak District National Park lies at the southern end of the Pennine hills between the cities of Sheffield and Manchester. It was the first National Park to be set up in Britain, in 1951. It covers 1,438 square kilometres, including parts of six counties, but the largest proportion lies within Derbyshire. A landscape of rolling farmland and steep-sided dales, the WHITE PEAK lies on limestone deposited 350 million years ago when the land lay under a warm tropical sea. The fossilised remains of the millions of sea creatures that form the limestone can be seen in the drystone walls crossing the fields on the limestone plateaux. Steep-sided dales contain ancient woodland and many wild flowers. Water dissolving the rock forms underground streams and caves. 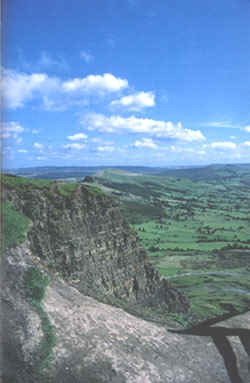 The DARK PEAK is a landscape of contrast, between the moorland plateaux and cliff-like edges of the millstone grit rock and the broad flat valleys. The moorland area is over 300 metres above sea level and is covered by a thick layer of peat. The soil is acid and only a few plants grow; much of the moor is managed for red grouse and sheep farming. Areas of ancient oak woodland still survive below the edges and in steep sided cloughs. 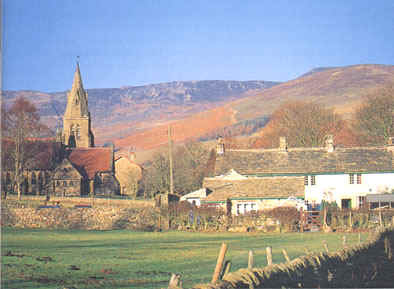 The shale valleys contain the best farmland and some have been used to form reservoirs. 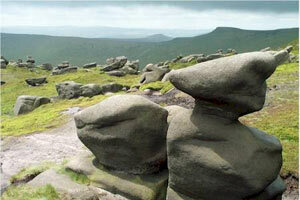 Each year nearly 30 million people visit the Peak District National Park. In addition to the natural features such as hills, valleys, lakes and caverns, there are many other attractions, from the magnificent Chatsworth House, home of the Dukes of Devonshire, to the picturesque stone-built villages. The main town lying with the national park boundaries is Bakewell, while the spa towns of Buxton and Matlock lie just outside the boundaries. Other favourite tourist sites are Castleton, famous for its show caves and the unique Blue John Stone jewellery, historic Haddon Hall, the beautiful valley of Dovedale, and the long-distance trails such as the Pennine Way, which starts at Edale. 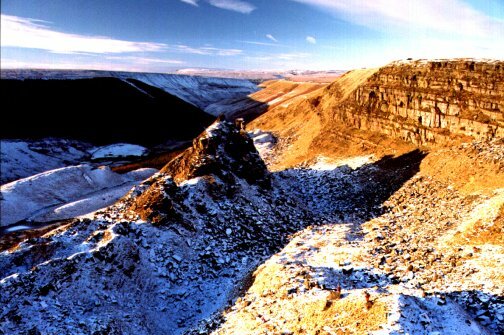 Quarrying and mining have been important industries in the Peak District for hundreds of years. Lead mining was once the most important activity, alongside farming. But these days limestone is the major product of the giant quarries, while other valuable minerals include fluorspar. Tourism is the other major source of employment.